TPP: The 2017 season is almost here and we enter it with Coastal Carolina as the defending national champions in college baseball. Can you touch on how surprised you were that this actually happened and also what effect, if any, do you think this will have on the sport in general moving forward? AF: That Coastal run was pretty special, wasn't it? I can honestly say that I was a believer in the Chants before most people — I thought they were going to be very good when I saw them in the fall of 2015, and I made sure we ranked them in the preseason, and I picked them to make it to Omaha heading into the postseason. But I did not expect them to win the whole enchilada in their first-ever trip to the CWS -- you just don't see that happen very often (in fact, a first-time CWS participant hadn't won it all since Minnesota in 1956). I thought it was great for college baseball -- it shows all those mid-major schools what can be accomplished if you really invest in your program the way Coastal has. You'd never see a story like this in college football; it's always going to be a power-five team hoisting the national title trophy in football. The fact that this can happen once in a while in baseball makes our sport special. TPP: I enjoyed it almost as much as I enjoyed 2010 and 2011. It is pretty unreal though to think the state of South Carolina has won three of the last seven national titles in college baseball. Let's get to the Fighting Gamecocks. Your site's first preseason poll came out recently and the Gamecocks sit at #4. However, you tweeted out several weeks back that with the Gamecock pitching you could see them being ranked #1 in the preseason poll. Is it safe for us to assume that Kendall Rogers didn't quite share your same enthusiasm for the Gamecocks? AF: I think it's true that Kendall had a few more reservations about the South Carolina offense than I do, but that's because I'm really buying in on a number of those players taking big steps forward (like Hopkins, Blair, Tolbert, Stokes, Cullen, Williams... really, I expect the whole lineup to be better). That said, it wouldn't be accurate to say Kendall is unenthusiastic about the Gamecocks — he likes them a lot too, especially on the mound. And we really did strongly consider them for the No. 1 spot. Personally, I think you could put those top four teams (TCU, Florida, Florida State and South Carolina) in any order — I really don't think there's a clear separation between any of them. There certainly is not a clear-cut No. 1 in my eyes, even though it might seem that way because TCU has been the consensus No. 1. That actually surprises me a bit — I like TCU's team a whole lot, but I frankly like Florida, FSU and South Carolina just as much. I figured there would be a few teams at No. 1 in different rankings. But I digress. The bottom line is, the Gamecocks are for real this year. And our Frankie Piliere just saw them this past weekend in Columbia and walked away as a true believer. I feel like I'm driving the South Carolina bandwagon this year, but he's now riding shotgun. TPP: I think all Gamecock fans have reservations about the offense. During this Omaha drought the main culprit has been the offense. Glad to hear you have confidence in an improved offense this year. Who are the newcomers on this Gamecock team that you think will not only have the most impact but are also the most crucial for the Gamecocks to get back to Omaha? AF: Obviously Carlos Cortes is the real big-name addition to this lineup. The guy is just a natural born hitter, and we ranked him as the top freshman prospect in the SEC. It's a big-time bat, and a guy that is going to make an instant impact, in some capacity. The question is where he'll play, but he's versatile enough to play the outfield or infield, and even if he has to DH, you're going to see that bat in the lineup. I'm also excited about Jacob Olson -- another very versatile athlete who can play any infield position or an outfield spot. He's got power, speed and feel for his barrel. This lineup has actually become really deep, to the point that they've got a bunch of talented guys who seem like they should be everyday players, but they're going to have to fight hard to get into the lineup. TPP: That leads us to the Brandon McIlwain question. Chad Holbrook came out this week and said Brandon would not be in the starting lineup initially. Is this due to the great depth of the Gamecock team or due to Brandon struggling to adjust? What have you been hearing? AF: I just think it would be hard for any player, no matter how talented, to break into that starting lineup without focusing on baseball full-time. Between Hopkins, Blair, Destino, Olson and Cortes, I just don't see how McIlwain could find a way into that outfield mix. You've still got John Jones at DH along with whoever doesn't wind up in the outfield. It's a good problem to have. 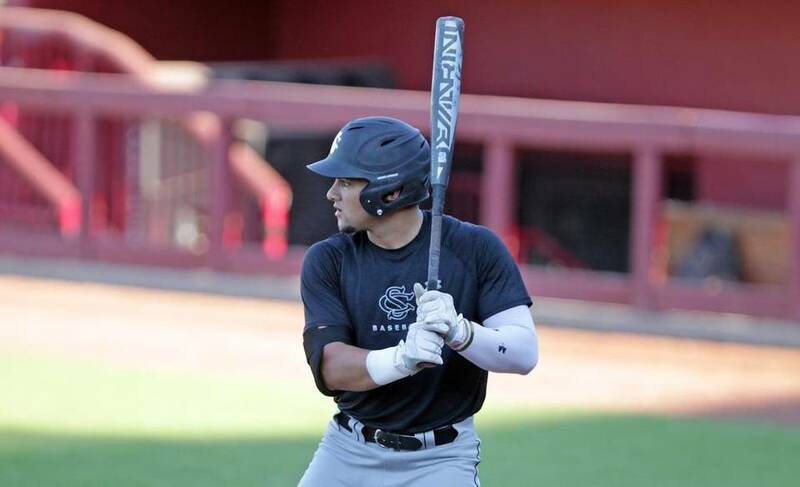 If McIlwain had spent the fall developing his baseball skills, maybe it would be a different story. But right now, I have a hard time envisioning him being a really significant factor this spring. TPP: It is time for the enemy question. Last year I expressed my worry to you about Clemson's future success due to the great hire of Monte Lee.You agreed with me but thought they might struggle a bit in his first season. In year one under Lee, Clemson surprised you and all of the experts by winning the ACC tournament and getting one of the national seeds. How do you think they will do this year and is Seth Beer as good as his numbers from last year suggest? AF: The Tigers definitely exceeded my expectations last year -- dramatically. I thought their pitching was going to be pretty ordinary last year -- and it was, frankly, but they still managed to earn a national seed. I thought they'd be on the at-large bubble. So give Monte and his staff a lot of credit for getting the most out of that club. They still don't have a lot of frontline power arms, but they've got some experienced strike-throwers, and there's no question they have improved their pitching depth. And the lineup should be very good -- deep, balanced, athletic and powerful. There's no doubt that Beer is the real deal as a hitter; he just has an uncommonly advanced approach for a power hitter, and his power is enormous. I wouldn't be surprised if there's a little bit of regression in Year Two now that opponents all know what to expect from him, but I still expect him to be an elite hitter, and I think the move to first base will be good for him, because he was not a good defender in the outfield. Sounds like he has taken to first base well. One of the great things about going to college baseball games is seeing future MLB stars. Being a huge Red Sox fan I am proud that I have seen the likes of Jackie Bradley Jr. Andrew Benintendi and David Price all in person while they were playing college baseball. If you skim through the Gamecocks home schedule, who is the one player (excluding Beer who we have already talked about) from an opposing team that Gamecock fans need to check out because they have the best chance of becoming a star at the next level? AF: Fun closing question! Several of college baseball's most talented pitchers are in the SEC, and the Gamecocks will see them on Friday nights. Alex Faedo and Alex Lange are both going to be big leaguers, but I think I'm actually highest on Vanderbilt's Kyle Wright, who really stands out for his command in addition to the quality of his stuff. And Gamecock fans will be able to see him in Columbia, along with Jeren Kendall -- the most talented position player in the country. If I'm betting on one player in college baseball to become a future MLB all-star, it's Jeren Kendall. That guy is just electric in so many ways -- he's got elite bat speed, he can fly, and he can really defend. Fun player to watch.